This post is for small to mid-sized manufacturers. We hope you find it useful. · When are you issuing material to an order, are you pre-issuing material to work a process and then receiving a finished product to stock at the end? · Are you backflushing raw material? Maybe you’re backflushing it at the end of the process, or maybe you’re using the backflushing tools that can tie directly to labor reporting. · There are different ways of handling inventory transactions. In some cases, folks would prefer to perform transactions on a one-at-a-time basis. Our consultants help you plan how to best use the applications to suit your individual needs. We can help determine the best set of modules and the best flow within those modules to satisfy your particular situation. PBS™ Manufacturing software for small businesses can accommodate many different types of manufacturer’s needs including Make to Order, Make to Stock and a hybrid of these. We find that most shops are at least partially Make to Order manufacturers; here’s how an order may flow through the system for this type of company. The Customer Order Processing module is where a sales order is entered, and here you can automatically apply pricing discounts as well. 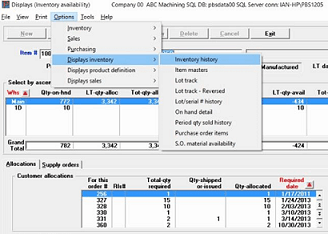 This application shows you the inventory you have on hand, what’s allocated, and what’s been ordered. During this process, you can opt to generate a shop order. This can even be automated. The application takes care of more than just putting some demands in the system. You do not have to backorder anything since you’ve set up a time-based backlog. You can schedule deliveries to occur just when you need them, and your production can be automatically scheduled to meet these delivery demands. With PBS™ Manufacturing software for small businesses, using a handful of keystrokes, you can set up a customer order, set up a line item, apply pricing discounts, and more. You can opt to create a shop order to produce the order, as well as a job cost master to track costs for that particular job. To learn more call Dave Dorsey at 800-969-7900 x145. Or Contact Us – We are here to help.